Do they have ranks or rank insignia? For those who dont know maybe a brief introduction is needed. 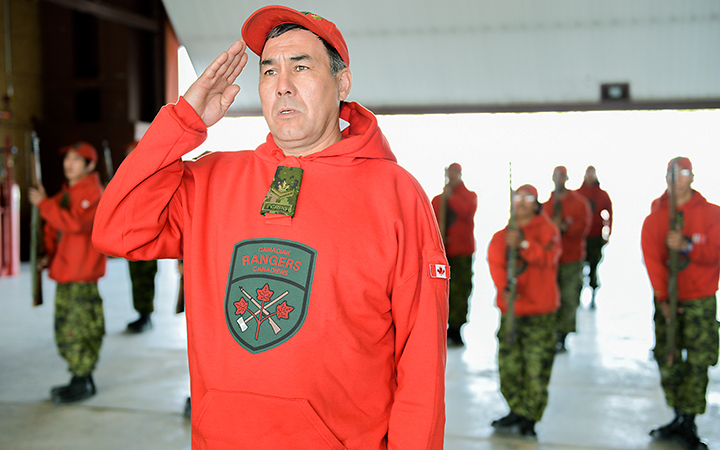 The Canadian Rangers are sort of a paramilitary reserve reconnaissance unit that mainly is responsible for providing a Canadian military presence in the far north Arctic areas and on remote areas along the East and West coasts to deter smuggling, illegal immigration, and to protect Canada's sovereignty and report unusual activity. They are probably one of the last military forces to still be issued the WW2 era Lee Enfield Mk4 rifle though I understand this will soon be replaced with a more "modern rifle" possibly the Canadian Forces standard issue C7 rifle. I believe they are similar to the Alaska National Guard's Arctic Scout Battalion. They are a very fascinating bunch of highly dedicated men and women and I have long believed that the US should create a similar organization to supplement our Border Patrol, Coast Guard, Customs and the US military in defending the land and coastal borders. ChrisWI wrote: Do they have ranks or rank insignia? As far as I could find, Sergeant is the highest rank in the rangers with officers being part of the Canadian Armed Forces' reserve. The Canadian Rangers are more or less the equivalent of the US National Guard. They are probably one of the last military forces to still be issued the WW2 era Lee Enfield Mk4 rifle though I understand this will soon be replaced with a more "modern rifle" possibly the Canadian Forces standard issue C7 rifle. I believe they are similar to the Alaska National Guard's Arctic Scout Battalion. I was talking with one of the rangers here in town and they said the calibre of their new rifle would be .308 or 7.62mm. So that leave th C& out of the picture. That will probably mean tthey will be issued the FNC1 (semi auto version of the FN FAL) Or maybe even the FNC2 which is select fire. fortsmithman wrote: The Canadian Rangers are more or less the equivalent of the US National Guard. They're not really comparable to be honest. The rangers are one part of the Armed forces reserves but I would say the primary reserve is actually a closer equivalent in term of appearance and organisation to the US National Guard except for not being answerable to the local Lieutenant Governor. Erskine Calderon wrote: They look like Webelos. Seriously though, I think because of their nature, the uniform that was adopted was purposefully made to look halfway between civilian and military. The Canadian Armed Forces have shown no hesitation to using blaze orange when appropriate. The beret for Search and Rescue Technicians is blaze orange, and I think it makes sense for the Rangers' uniform to be highly visible in an environment where it's hard to see things. About the rifle - I was under the impression (no hard references, unfortunately) that it would be a more modern bolt-action, like that used by the Danish Marines that patrol Greenland. The Rangers work in a harsh environment. And I don't think you could say anything in Canada was analogous to the U.S. National Guard. The Guard is somewhat sui generis. Our reserves are more or less exact counterparts to the U.S. Army Reserve etc. People have commented in the past on how the bright orange hoody looked less then military but was well suited as a all-purpose uniform. You would think that they would allow rangers in those circumstances to wear some formal wear. Either a civilian blazer with the Ranger patch and rank pin or even allow them access to CF dress with removable insignias. Concur, tho' it's possible Master Corporal Nickel wanted to wear his Ranger hoodie! jrichardn2 wrote: Concur, tho' it's possible Master Corporal Nickel wanted to wear his Ranger hoodie! I looked around but it would appear that i'ts standard. 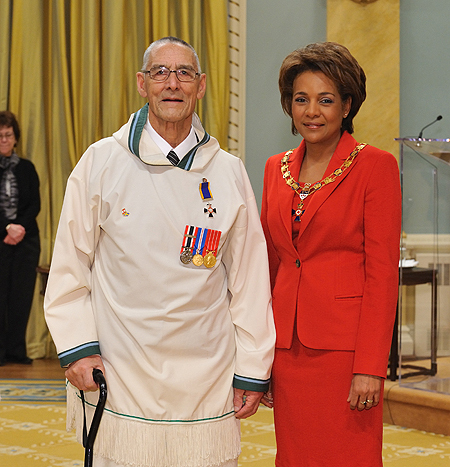 The only exception I could find was this man, Ollie Ittinuar, wearing traditional innu dress. At the time of his death, he was the oldest serving member of the CF (93 years old). The fact that his career stretched back to being a RCMP special constable might explain why he chose a neutral method of dress instead. 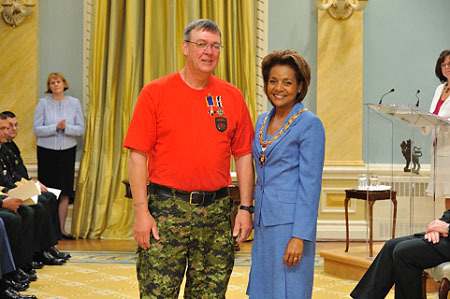 Something else of interest, canadian rangers patrol groups have Honorary Lieutenant Colonel. What makes this interesting is that since rangers enlisted personnel wear a different uniform then their officers, unlike the rest of the CF , their honorary lieutenant colonel is the only honorary officer that can be told apart at a glance from a his serving counterpart. Honorary LT colonel in the middle, reserve captain at the right.